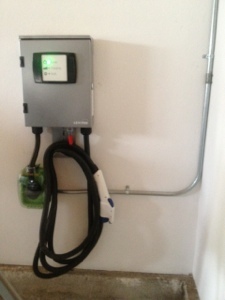 The process was smooth thanks to IES Residential Electrician out in Corona, CA. They have the exclusive rights to install all Leviton Chargers in Southern California and go far out as installing in Bakersfeild, CA. I’m impressed by the 10 year warranty on the charger itself and a 3 year warranty on the cable. Other companies I hear offer as little as 3 year on the charger so 10-year warranty is very nice. A hiccup that was not anticipated was to require the charger to hang on a wall stud. So the original placement on the right wall which made for a neater install would not do since there was only drywall. The result is a extra conduit that looks a little less tidy. I’ll porbably paint it white when I have time. An over the counter permit has to be issued for the install amounting to ~$180. The total cost of installation for parts, labor and permitting is ~1800 and takes about 3 hours in my case since around 40′ of metal conduit was installed. After the city verifies the installation, hopefully the process of getting the Honda Fit EV will be quick.